Dolphins aren't the only aquatic mammals fighting human battles. The US Navy has long been training sea lions as equipment retrievers and underwater sentries. 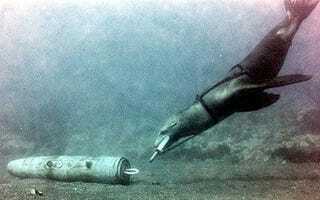 Now they plan to outfit a naval base with mine-sweeping, diver-trapping sea lions. Along with dolphins, California sea lions have been part of the US Navy's Marine Mammal Program, which employs animals for a wide range of military purposes, for decades. They have long been used to retrieve objects lost or fired underwater, but, in the last few years, the Navy has placed sea lions on more active duty, employing them as sentries for military ships and piers. The animals can apprehend and detain divers, who could be enemy combatants or saboteurs, by placing a special clamp around the divers' legs attached to a line. Once the diver has been immobilized, human operatives can then reel the diver in. Their training in object retrieval has also made them ideal agents for locating and identifying underwater mines. There are currently just 28 sea lions in the Navy's ranks (along with 80 bottlenose dolphins and a Beluga whale), but one team is about to get a permanent posting. The Navy has just announced that a team of sea lions will defend the Kitsap-Bangor base in Washington State, patrolling for divers, looking for explosives, and participating in naval exercises. But how long will it be before the sea lions team up with the dolphins and use all that military training to overthrow their human masters?